See the list of books that Central students will be reading for class this year. Great fun in the library bringing folktales to life in our own unique Central way. Thanks to Eric Dabney and all the 7th grade students for a fabulous storytelling day. sales will go as store credit for the purchase of books for the library. up day and have signed by those authors when they come in the fall and spring. Be part of Central’s summer reading club. Click here for the brochure. We had a great day at the Oklahoma Intermediate Sequoyah Award presentation with 52 Central students and multimedia teacher, Dianna Clark. Shelley Coriell, author of Goodbye, Rebel Blue gave a wonderful talk about how her personal story interweaves with Rebel Blue’s story. Several of our students participated in her interactive segment, demonstrating how many people are involved in getting a book published or made into a movie. Every student attending from Central was given a book to be signed by her. It’s March Book Madness Reading Tournament time! Join us in participating in our 2nd annual Sweet 16 book reading campionship and help us crown a winner. Watch the video and vote for a book in each bracket through your English Language Arts classes. Central is honored to host award-winning YA author Jonathan Auxier on March 6th. He will be speaking to all three grades throughout the day. Selected students will be attending a luncheon with him. He will also be autographing books at a designated time during the day. Students may see Ms. Craven for order forms. His books are: The Night Gardener on the 2017 Intermediate Sequoyah list, Peter Nimble and His Fantastic Eyes, Sophie Guire and the Last Storyguard, Spirit Animals: Burning Tide. Students have been working on art projects for his visit. All 8th-grade students were treated to desserts, lemonade and a murder mystery, “Murder is Served” performed by several 8th grade students in Lady Craven’s mansion during three rotations in the media center on November 21st. Central students presented care givers at AMG Rehab Center and Specialty Hospital on 9th street with Wendelin Van Draanen’s YA book, The Secret Life of Lincoln Jones. The story is about Lincoln Jones, a twelve-year-old boy who spends his after-school hours at a memory care facility where his mother is a care giver. 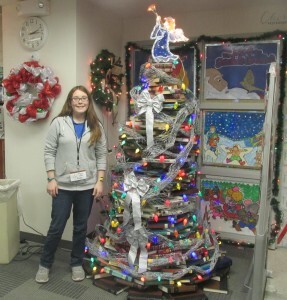 Our 3rd annual book tree created with over 600 books is center stage in the Central media center. Central students exercise their right to vote during a mock election held in the media center. Central’s 7th grade science classes were treated to a fun, hands-on technology experience in the media center provided by The University of Oklahoma’s Digital Store. The students rotated stations as they experienced ozobots, virtual reality roller coasters, leap motion,​ and remote controlled robots. Well, it’s about that time again! School is almost out and summer will be here soon. In between sleeping in, hanging out with friends and going to bed late, why not squeeze in some reading? For more information on the Summer Reading Program, download the Summer Reading Program brochure. Central students who participate in the Summer Reading Program and fill out the Books I have Read form will earn prizes. Incoming sixth graders are also encouraged to participate. For reading ideas, check out this great list of summer reads – there’s something for everyone! For more book ideas, scroll down for a list of the 2016-2016 Intermediate Sequoyah nominees, or watch the book trailer for a quick preview. The media center is hosting a characters from fiction, biographies, and nonfiction luncheon in the media center at 11:25 a.m. on May 12. Come dressed as your favorite character, place, or thing from a book. We will share our characters’ stories as we enjoy a tasty meal. See Ms. Craven about the details and sign up to attend. 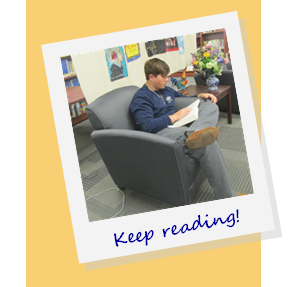 Each month Central students have the opportunity to participate in Book Bistro. Students read the designated novel, then on the day of Book Bistro, students will meet in the media center during their lunch break for a lively discussion of the book and some delicious refreshments. For April’s Book Bistro, sixth graders read The Schwa was Here by Neal Shusterman and seventh and eighth graders read Peeled by Joan Bauer. Students interested in participating in Book Bistro may sign up in the media center. Central Media Center recently offered students the opportunity to have a blind date with a book. Books were wrapped and a “dating profile” describing the book was pasted on the front. Students selected books based on the profiles, and only after checking them out were they able to unwrap the books to see what they got. The students were happy with their selections and returned them after reading the entire book. Wendelin Van Draanen’s new book The Secret Life of Lincoln Jones will be released October 25, 2016. Watch out for Lincoln’s school librarian Carrie C. Raven – sound like anyone you know? On April 8th, Central Middle School students had the unique opportunity to explore emerging technologies in the media center. OU presented Digital Day, offering students a hands-on experience with robots, programming, circuits, virtual reality and more. Students were encouraged to independently explore and experiment with the tools in an unstructured learning environment. OU staff and students were quick to answer questions and offer assistance to anyone who wanted help. Central students and teachers had a great time creating and experimenting using the devices set up at each of the stations. Many thanks to OU for this wonderful opportunity! Stop by the media center to see how school libraries transform learning at Central Middle School! The butterflies with names show the number of books each of the top 30 students has read. Central’s Media Center is hosting its first March Madness Reading Tournament. We will start the first round of voting through each grade’s English classes next Monday. Students will vote for one title from each bracket in the first round of Sweet Sixteen Titles. We will complete the voting on Wed., March 30th and announce the Elite Eight Titles on Thursday, March 31st. The second round of voting will begin on Friday, April 1st. The Final Four and Winner will be voted on the week of April 4th, with a Champion Book Title crowned on Friday, April 8th. Stay tuned for more details. The winner of the first annual March Madness Reading Tournament is The Maze Runner by James Dashner! THE BOOK GAME IS ON WITH A HALLWAY DISPLAY SHOWING THE TITLE BRACKETS. 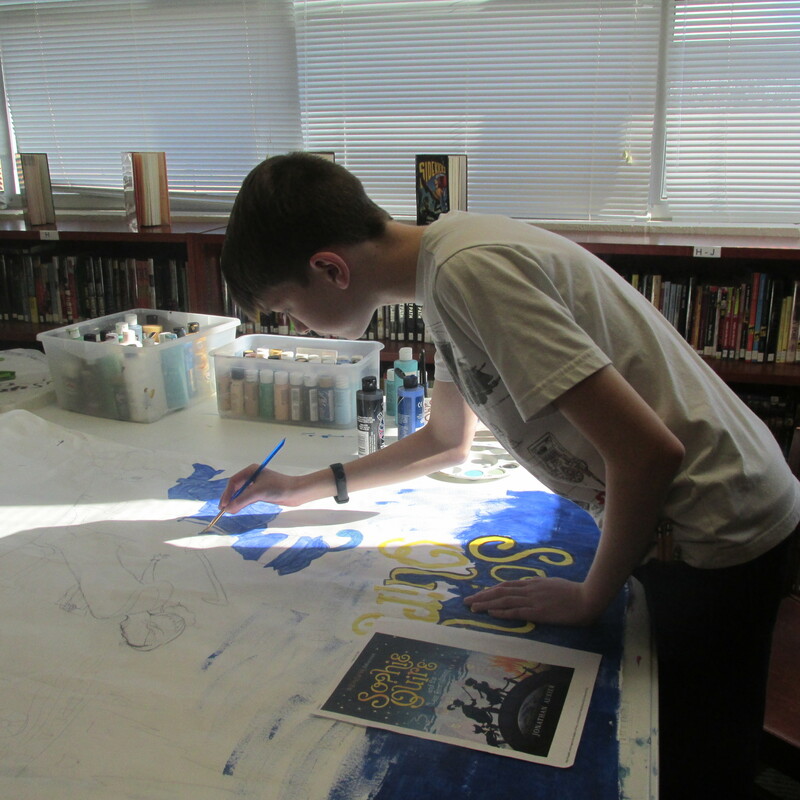 The halls of Central Middle School are home to numerous tapestries and posters depicting well-loved books. A wall near the library features author portraits painted by Central students and signed by the authors themselves. Here, Central students pose with some of the unique book-related items around campus. Joelle Charboneau’s visit with ALL Central students on March 7th was phenomenal. She spoke to each grade in the cafeteria with a portrait of her in the background. The portrait was drawn and painted by a very talented 8th grade student, Addison Hecker. In another Central tradition, sixth grade English students enjoyed bowls of soup in the media center while seeing scenes acted out from Sharon Creech’s novel Granny Torrelli Makes Soup. Teachers also shared inspirational stories from Chicken Soup for the Soul. On February 24, 2016, 7th grade science students came to the media center for a lesson about heredity, selective breeding and dogs, presented by Janet Miller, an OU student interning in the media center. Students have been studying heredity and selective breeding in their science classes and today learned how people used selective breeding to develop different dog breeds, all of which originated from tame wolves. Students had the opportunity to research the origins of the dog breed of their choice, create their own “designer dog” and play a game to test their ability to selectively breed dogs with certain traits. In conjunction with African American History Month in February, sixth grade students at Central Middle School researched African Americans of Achievement and created silhouettes surrounded by information about the individuals they researched, including their achievements, memorable quotes and interesting facts. Each year in December, the media center hosts a Victorian Tea, which has become a beloved tradition at Central. This year, students dined on a variety of sweet and savory foods including turkey, potatoes, cookies and cakes. Sipping on cider and tea, the students enjoyed performances by the orchestra and drama students singing traditional carols and acting out scenes from Dickens’ A Christmas Carol. Many students dressed up for the occasion, and all were practicing their best manners as the Queen of England herself was in attendance. When Sonia Gensler visited Central Middle School she was welcomed in true Central fashion with plenty of fanfare and excitement. Gensler spoke to students about her work and the writing process and interacted with students on an individual basis while signing her books. Central drama students performed scenes from Gensler’s novels for an audience composed of their classmates and Gensler herself. Wendelin Van Draanen, author of 32 books for young adults, has visited Central on six occasions. Her last visit included a grand entrance into the school cafeteria on a motorcycle in honor of her Sammy Keyes book, Sammy Keyes and the Wedding Crasher.